Paranormal Photograph or Not of Ghost Child? One of our members received this photo from her mother. Is this paranormal, a ghost or not? We are posting it so that we can get conversation flowing as to what readers think……. Can we have your opinion? « Memphis and Voodoo Village – Haunted or Not? The little girl in this picture is a hoax its from an I-phone app that allows you to post ghosts in your pictures. Thanks for your response. This is what I believe, but thought we would put it out there for the visitors to discuss. After talking with Martha and getting more details. I asked her to check and see if there was ever a fire at that house or one that had been on that site before that had burned down with a child age 5 to 7. She is looking into it. I believe this to be not set up, but a bad photo. Someone who took the photo, had a slight jerk at the end of the photo taking. 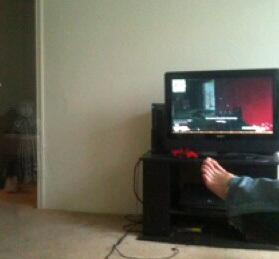 First clue: Why would someone take a picture of this guys foot and t.v.? Clue two: It may not be a picture of a guys foot but a bad picture of the child/doll coming out of the room. When people take pictures it is usually of a specific item, So not the foot but the child was the item. It just didn’t quite come out right. I don’t see the ghost. Am I looking at the right picture? The one above? If you look into the room on the left and enlarge the picture you will see a figure. My question is real or faked…. E’Anne – you will be missed by many. So glad to have been able to get to know you before you left this earth. Looks like a child staring out of the doorway to me! How can you hoax that one? I’ve seen photos that have real looking people in them , that just should not have been there at all, not to mention a different era! This is awesome!